When and How Do I Tell My Child They Have Autism? Do they know they are different? Does it bother them? Do they ask questions like What is wrong with me? What is their age? It is not likely a 2-year old will understand, but a 10-year might find this really helpful to understand why certain things can be challenging for them and not their peers. What is their level of function? Those with severe autism and perhaps other comorbidities may never understand what you are trying to explain to them. Kids who are extremely high-functioning and self-aware may start to recognize at a very early age they are different and the unknown (why) may be causing more anxiety then you know. Have you come to terms with the diagnosis? Has your family? If you tell your child before you or some of your family have been able to process it, it could make things harder on your child if they see that someone else is in denial, or thinks this means there is something ‘wrong’ with them. When MJ was diagnosed with high-functioning autism (formerly known as Aspergers) at the age of 3.5 we didn’t tell her right away. We knew we would have to tell her soon, because she was very self-aware. She knew she was different and she knew at that young age there were things that bothered her that didn’t bother other kids her age. She started asking me complex questions well before I was prepared, first asking me what death was (no actual experience with it at the time, and her media was very censored) before the age of 3. She continued to ask me such questions, and started asking why she was different. This was happening at a time when we were also introducing therapy to her, where her Autism Support Workers would come to our home or her daycare and work with her, but the other kids didn’t have anyone like that. One day, after a bad meltdown (she was almost 4) she started asking me why she had them. I sat her down and took the plunge and for those who know me, you know I don’t often struggle with words, in fact I know I talk too much and the idea of being “brief” isn’t exactly in my wheel house. YES! In one simple moment she had explained it to me better and simpler than my jumble of words. 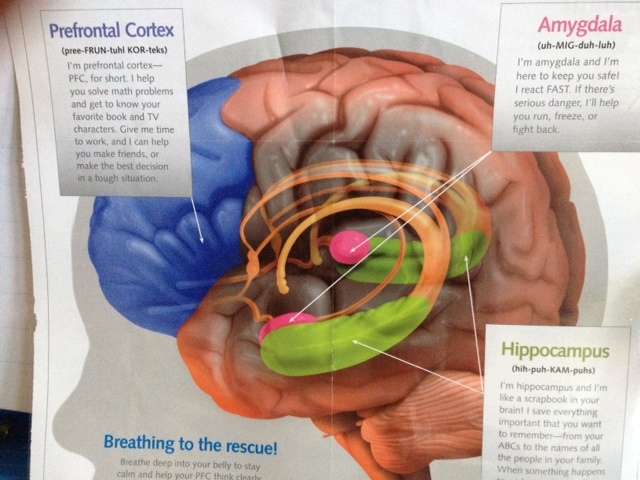 Because MJ loves science and learning about the body, we took an approach to teach her all about the brain. Our clinical supervisor turned us onto the MindUp Curriculum created by the (Goldie) Hawn Foundation. We used these lessons to help her learn how to be mindful and almost like a desensitization program. It helped us teach her about sensitivities to sound and smell, and what happens to our brains – her brain in particular – when we experience senses we do not like. It’s a fantastic tool for all kids, not just those on the autism spectrum. It teaches them how their brain works and when their brains might close and what to do about it. It was very useful in helping with self-regulation, a struggle many kids have, and one that’s much more challenging for children with ASD. Here’s a little video explaining the concept. I actually am hoping to suggest it to our school and see if they will implement it in the classroom. They have a series of different curriculum/lesson books from Pre-K up to Grade 8. When I first told MJ it was because she asked, and I’ve always been honest with her when she asks questions. I didn’t have a book and in hindsight, I wish I had of. I can see she is still struggling with being different so I’ve been looking into books that would be suitable for her. I’ve compiled a list below and will say we’ve used the When my Autism Gets too Big workbook and it was very helpful (although we modified it slightly to suit our needs). If you’re struggling with whether to tell your child and whether the time is ‘right,’ here’s a very helpful article from the Indiana Resources Center for Autism that just might help you decide.